As a marketing blog, we spend a lot of time talking about the latest and greatest marketing strategies and technologies. Twitter, viral videos, and Google are definitely among our favourites. As are social networking and new media in general. But lets not forget about the simple power of a room full of people. 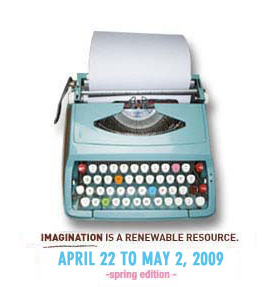 And that power is what the Ottawa International Writer’s Festival, running through to May 2, is all about. Last Thursday I had the distinct pleasure of attending “The Big Idea” session the carbon shift, led by Canadian writers William Marsden and Thomas Homer-Dixon. The topic was at times very tense and distressing, and there was definitely something viral about the way the energy moved through the room. In the end, however, I left feeling more alert and also more connected than I have in quite some time. I guess my point is this: that while webinars, tweets, and wall posts are all well and good (and, sometimes, the most effective way to communication), there is still something to be said for the energy that can only be created by bringing people together.